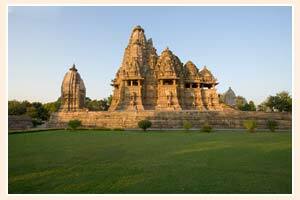 Khajuraho is a village located in Chhatarpur District in the Indian state of Madhya Pradesh. It is one of the most popular tourist destinations that have the largest group of medieval Hindu and Jain temples. The temples were built during the reign of Chandel Empire from 950 to 1050 A.D. There were around 85 temples in Khajuraho, however, with due time only 22 are left and rest of all withered away. The temples of the Khajuraho attract number of visitors every year with their intricate and exquisite sculptural art. One major attraction of this temple is the dance festival celebrated annually in the month of March. In this spectacular event, the tourists enjoy the rich classical dance traditions of India.